THE IDIOTS' BOARD: A HANDICAPPED AIN'T HEAVY! 1. A hydrophobic military officer carried by someone else sporting the best of his smiles. The general's order to somebody who is not his direct subordinate: "Carry me, I ain't heavy. I am truly handicapped!" 2. A general's message to the poor and innocent man: "You're so lucky, you've got the permit to carry me!" 3. 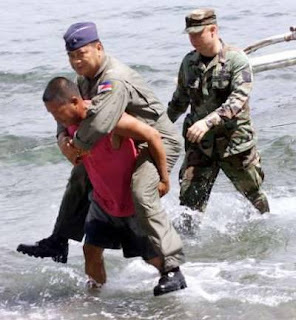 After long years of training, tests and physical and psychological preparation in the Philippine military training - this is what you will get. The better word is PRIVILEGED! 4. With no hesitation, the privileged officer is carried for one reason: HANDICAPPED. Credits we owe to the good officer, despite his poor condition, he was able to perform the job in his own best way. 5. The very much respected officer carried himself his motto with valor: "Thou shall not get wet, if someone else can carry you!" (Well said with perfect smile.) Very inspiring isn't it? 6. According to rumors, this officer is eying the top position for Philippine Navy. - Position to be carried. Good luck to your endeavors!